Luxury means going overboard on the catch 22 that is the pure ecstasy of pleasure. Actually it has many definitions today: lavishness, conscious abundance or perhaps having things we do not need for the sake of ease and comfort. But why do I say the ecstasy of pleasure is a catch 22? I say this, because your life and my life are fleeting insignificant specks in the timelessness of the universe. Can you tell me otherwise, of course you cannot. Yet the truth is hard to bear when we are pushed up against a wall by our own insignificance. So what do we do then? We spend our resources on the luxuriousness that life has to offer in the hopes of forgetting what it is that makes us insignificant in the first place. Now in my humbled opinion, if one were to try letting go of the stigma of insignificance they would do the usual human practice of retaining ones worldly desires and pleasures with any means available and possible. Even, and I will say this bluntly, at the insignificance of other, people will climb on the downfalls of their peers, desperately trying to make a name for themselves. Logically speaking everyone is different and unique and will act thusly, yet luxuriousness is actually quite simple. A bath is a luxury to some or even a simple sandwich with peanut butter instead of nothing is a luxury to some. So you see that pleasure is not a place that you have to run around trying to find. Pleasure is like pain, it is all around you all the time. Take pleasure in breathing because you have air to breath, revel in the ecstasy of the senses because you can sense your own insignificance at all. But this is an article about luxury bathtubs, so let us get into it. Bathtubs were designed for cleanliness because as they say, cleanliness is next to godliness. The ancient kings, queens and nobles of the past bathed themselves religiously like a Jew keeps kosher. Dating back to almost 3000 B.C. bathing has become a daily ritual that we almost cannot escape. Whether it is in a river or a hot tub bathing has its roots deeply implanted in our society. In ancient times water was seen as a purifier of both body and soul, and this is somewhat true. Water is the purifying essence of life, without water life on Earth cannot exist. I am I correct when I say there is a certain allure of purification when you are done with a bath, shower or perhaps a refreshing swim? Do people not long for the refreshment of a bath at the end of a long day? Water calls us to it in an almost unfettered manner that we just cannot ignore. We built grand bath houses that the Gods would be jealous of, all in the name of water and cleanliness. To the ancient Romans it wasn’t just about the bathing itself, they used to spend hours in their bath houses bathing in sheer unadulterated luxury. 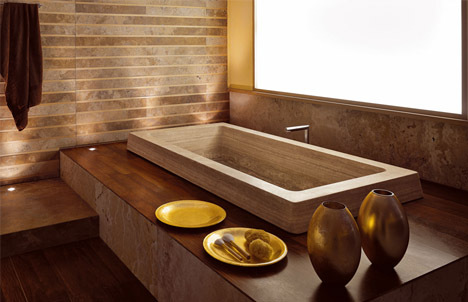 Spas like bathtubs are basically trying to bring the spa like experience into the everyday bathing experience. Who wouldn’t want that, honestly speaking? These bathtub designs incorporate, water jets, bubbles, foam or even the use of sound to send vibrations through the water for maximum relaxation. Chromatherapy and hydrotherapy are also huge factors in luxury spa bathtubs. Chromatherapy is the use of ambient lighting to induce states of deep relaxation and even healing, whereas hydrotherapy is the use of water for the maintenance of health. The combination of the two is a potent bathtub combo and is worth an investigation. Some specialist bathtubs allow you to control the temperature of your bath to the degree, the water jet style and power, bubble intensity and so on. Some even have waterproof speakers and controls so your relaxation music is never more than an arm’s reach away. As homes are becoming more and more wireless, it is only natural that you can now run a bath from the couch using your wireless home remote control. There are few things that are better than relaxing inside a nice hot bath and people just have to take it to the extreme. At the end of the day, if you are going to bath anyway you may as well have a luxury bathtub. It is a great addition to any bathroom and well worth the money they cost.